Six years since we made our debut at The Dark Room, Crisis Hopkins is now coming to an end. Our grand experiment- a democratically-run comedy troupe that ran the gamut from scenic shortform improv to tightly written sketch comedy – now comes to a close. Six years is a healthy chunk of time for what was essentially a leaderless organization, and it was a important learning process for me personally. From our beginnings at the Dark Room, through our residency at The Climate, our revues at Stagewerx, our revival of the San Francisco Improv Festival and regular hosting gigs at Lafayette’s Town Hall Theater, we put a premium on our roles as actors and performers, and consistently put forward smart, topical comedy for general audiences. I’m more than proud of CHop’s track record, and I look forward to building on what I learned in this laboratory in my future work. If you’re reading this, you’ve supported us in some way. Thanks for that, and thanks for supporting live, local comedy in the San Francisco Bay Area. Most of us will no doubt continue performing in the area. It’s more than likely that we will also work together at some point. When that happens, we hope you come check it out. Thanks again for everything. Crisis Hopkins was and forever will be: Cassidy Brown, Dan Burt, Christy Daly, Lily Harvey, Chris Hayes, Chrysteena Lairamore, Chris Libby, Rebecca Poretsky, Phil Ristaino, Sam Shaw, Anthony Veneziale, and Jamie Wright. Thanks for your support! Our third meet-up with the Bay Area’s favorite political satirist Will Durst, right before tax day! These are our favorite Town Hall shows, and we’re always honored to share the stage with this legend. We can’t wait to bring our topical sketch and “seat of the pants” improv comedy the Town Hall, opening for the man the NY Times dubbed “possibly the best political satirist in the country”. Tickets go fast, so be sure to buy in advance. Not to be missed! 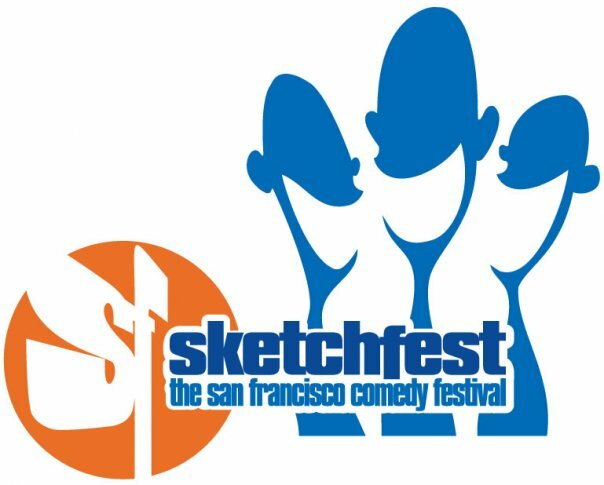 We can’t wait to come back to SF Sketchfest, the Bay Area’s yearly celebration of sketch, improv, stand-up, musical and alternative comedy. Due to a sudden outbreak of babies, we didn’t make it to Sketchfest last year, so we’re super-excited to return. We’ll bring sketches from our October show as well as some new material. Hope you can make it! at The Dark Room, 2263 Mission at 19th, SF. We had an amazing time putting Panderfest 2011 together with Mission Control. In addition to adding some dope new sketches to our repertoire, the show provided us the opportunity to help break in a new space – Stage Werx 446 in the Mission District. Thanks to everyone who came out to support the show. Extra special thanks to: Ann Marie Alanes, Cassidy Brown, Rebecca Poretsky, Lily Harvey, Ty McKenzie, and PianoFight. 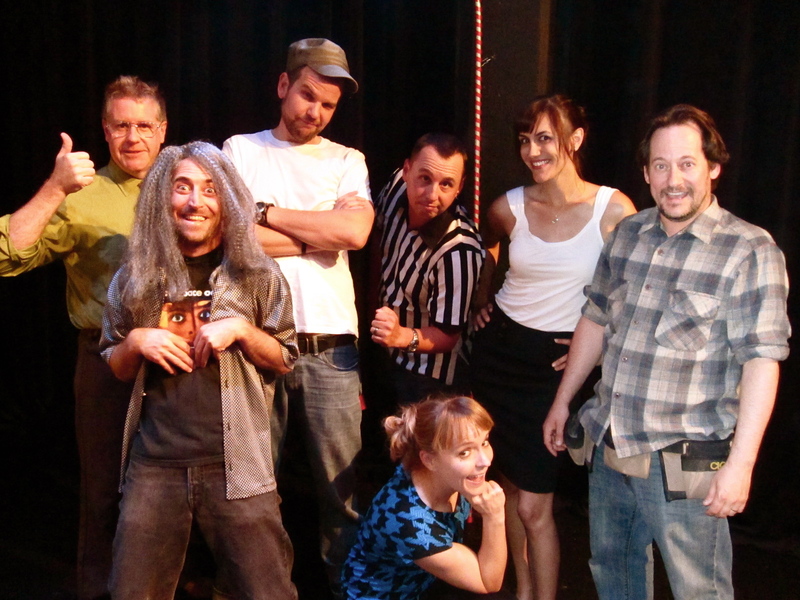 Pictured above, the Crisis Hopkins Pandercast, from left to right: Chris Hayes, Phil Ristaino, Jamie Wright, Dan Burt, Chrysteena Lairamore, Christy Daly, Sam Shaw. The PanderFest 2011 pandermonium is well underway here at Crisis Hopkins and across the nation. While many have already made the switch to the PanderFest lifestyle of satisfaction, no lifestyle movement is complete without an omnipotent godhead to guide it. 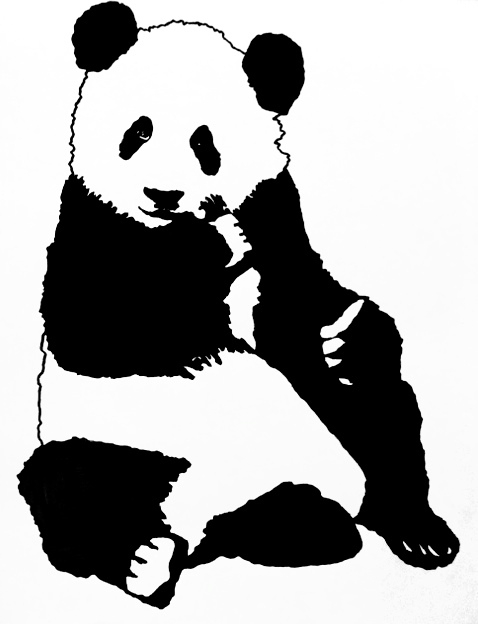 Allow us to introduce to you, your PanderFest 2011 mascot, the Pandering Panda! Isn’t he cute? He knows pretty much everything there is to know about satisfying the public, including when to sneeze. But if there’s one thing he knows the people love most, it’s calling the shots. That’s why the Pandering Panda is letting YOU decide what he says on the official PanderFest t-shirt. And why wouldn’t he? You guys are really smart about this sort of thing. Just head over to Cloudship Creative’s website and comment on the article with your best pandering line for a chance to have a thought from your own brain show up on the PanderFest tee. The winning panderer will even win a t-shirt for their mental efforts, just remember: the Pandering Panda will say pretty much anything, so long as it panders to the audience. The contest closes tomorrow, so get over there now! Yes, creative participation is both fun and rewarding, but PanderFest research indicates that most actually people prefer to think nothing at all. If you think not thinking sounds great, we think we’ve got you covered. This very website is littered with links to tickets for the show but you can always simply head to PanderExpress.com, pick a date, purchase a ticket, and show up at 446 Valencia at 8pm on that date to put yourself in the hands of comedy scientists who will do all the thinking for you. It’s so simple! For all you brainiacs out there, you can even enter the code ‘PANDERME’ when buying your ticket to knock $5 off the price! Buying in bulk (6+) or before opening night (October 7) will also save you some scratch. Options! The only decision you really have to make is whether or not to allow PanderFest and its Pandering Panda pleasure you and let’s face it; you earned it. Now get over to Cloudship Creative and make that panda purr!